It's no secret that I'm a bit obsessed with my camera. OK. Fine, cameras. I have the big one for good shots, the little one I keep in my bag, the one on my phone, and the Flip Mino that also lives in my bag. My girls constantly clamor to see the pictures on the computer, and C has now taken to running into the room to get me whenever Little L is doing something cute, naughty, or downright disgusting screaming "Mommy! Get your camera! Quick! Quick!" so I can be sure to capture the moment on film. So, I'm sure you're not surprised to learn that both my girls are fascinated with cameras, especially Little L who knows that she is absolutely, under no circumstance, allowed to touch any of the cameras. (Except maybe the Flip, because there's very little she can do to that one.) But I found the perfect toy for her! The Parents Look-At-Me Camera. Parents is well known for creating toys that uphold their "When the toy does less, the child does more." philosophy. The Look-At-Me Camera is no exception. 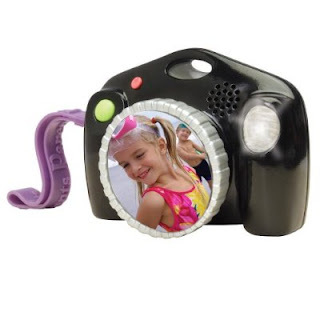 It's utter simplicity, big shiny "lens," chunky body perfectly sized for little hands, and three buttons pushes the child to create the play instead of reacting to the toy. Little L loves pretending to take pictures like mommy. C loves hamming it up and seeing herself reflected in the lens, and the button that plays a funky little disco soundtrack gets them both dancing! The fun little quips make the girls laugh and I love seeing their delight with the realistic sounds. This is a cute and fun toy, but it's obviously just a toy so it's not doing anything to keep my kids from lusting after the real thing! For $15 the Look-At-Me Camera is a great little toddler toy that should be a part of every aspiring photographer's arsenal! Country Bob's All Purpose Steak Sauce Giveaway Winner! Congratulations! I hope that you fall in love with the sauce... oh and that you eat it up fast because my husband might try to come steal it from you. When I was a kid we collected cards. They all came in little shiny packets with a stick of extremely stale gum. Remember that gum? It always crumbled and tasted terrible, but we always ate it, or at least I did, I'm not one to pass up candy of any kind. Today kids collect cards that come with Internet codes; infinitely cooler than stale gum (and not as bad for your teeth) especially when the cards are Bella Sara cards and the code gives you access to brand new ponies and horses. No, not real horses, virtual horses, the kind you can brush, feed, clean up after, and play games with all from the safety and warmth of your home. I know! How crazy! 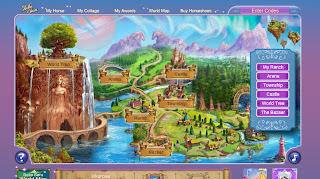 - Very fun engaging interactive site, with awards, and games, and glitter! Such fun for young girls! - The site is 100% secure and does not offer a way for online interaction with other site users. - The site has a parent section where you can check in and see how your child has been playing. 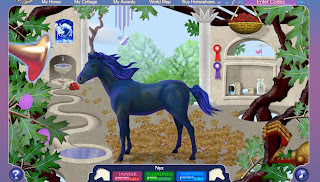 - Bella Sara cards (available for $2 or so per pack at most big box stores) open up more aspects of the site and grant you extra horses to care for, but children can start playing even before getting cards. - Inspirational quotes! Need I say more? - At times the site runs a bit slow, but I was able to play a number of the games with no issues. All in all this is a lovely game that I can see young girls enjoying online and in the schoolyard for a long time to come! Buy Bella Sara cards here and play Bella Sara here. Have fun! Country Bob's oh so good sauce - review & giveaway! A while back I was asked to review Country Bob's All Purpose Steak sauce, and being a big steak lover I jumped at the chance. Then the sauce arrived and we went through a phase when we just didn't eat a ton of steak so I never got to try it and I might have maybe forgotten about it for a bit. Then, one day, we had steak! And we had sauce! And I put them together, but not nearly for long enough, because as usual I didn't have time. And I wish I could say that the heavens sang and I was thrilled with the sauce, but the truth of the matter is that after marinating for five minutes in Country Bob's sauce the steaks weren't all that great. So I put the sauce aside and I decided to try it with hamburgers before writing the review. Guess how long it took me to make hamburgers? That's right, weeks and weeks. And then, thank goodness, I did have hamburger meat, and I did mix it with Country Bob's sauce, and the heavens did sing, but I had trouble hearing them over M's Mmmming and groaning with delight. - This aromatic steak sauce is delicious mixed with hamburger meat. It makes juicy, tasty burgers that leave you licking your fingers clean. - Very versatile sauce that can be used in a multitude of ways. Recipes are offered on the site. - Country Bob's company is, ah, somewhat religious, which is a great thing if you're into that! - You can get a personalized label and corporate gifts on the site! - If you marinate your steaks for all of five minutes and hope that slapping a ton of sauce on while they grill is going to help, you might be disappointed. The steak sauce didn't really do much for the steaks, though I have a hunch that overnight marinating might create a delightful dinner. - Not available at my local grocery store, but I think that M would leave me if I didn't start ordering it regularly, so I'm going to get on that. All in all Country Bob's All Purpose Steak Sauce was a great hit with us and I'm definitely turning it into a family staple. I highly recommend it, and if you're not convinced I I can just tape M's happy eating sounds next time I make some burgers, which, if this week is anything to go by, might be in a day or two. 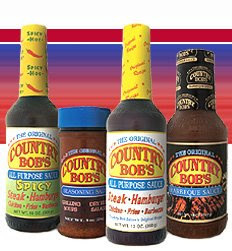 Buy Country Bob's All Purpose Steak Sauce here. If you have a meat lover on your holiday shopping list, this is the perfect gift. Country Bob's All Purpose Steak Sauce giveaway! Not one but TWO of you fantastic readers are going to get to try Country Bob's for FREE! Yes! I'm know, you're excited, so hurry down to the comments section and tell me your favorite steak or hamburger memory to be entered for a chance to win. (Don't have one? Make one up!) Then, to get another chance to win, head over to Country Bob's site and check out the recipes. Come back and tell us which recipe is the one you're most excited to try. As always if you twitter, blog, or email friends about this giveaway come back and tell us to win even more entries. And as always, if you don't leave me a way to contact you I won't be able to tell you you won! Givaway winners will be chosen on Tuesday, December 9 at 12PST.